Radio Free Palestine explains how the Holy Land has been betrayed for nearly a century and how its people, Muslim and Christian, have been cruelly abused and dispossessed in order to fulfill the Zionist grand plan to steal and occupy the entire territory permanently. To start reading Radio Free Palestine, simply click on the image (below) or read on for an explanation of the “Flip Book” controls. 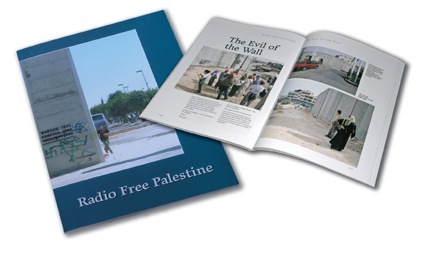 The book is 172 pages with over 110 colour photos and a Foreword by 2006 Nobel Peace Prize nominee Jeff Halper, Co-ordinator of ICAHD (Israeli Committee Against House Demolitions). An overview of the book controls. The book has been created online as a “Flip Book” so you can read it online as you would a paper copy. The controls are quite simple but here is a quick overview of the main functions. Below is a list of the toolbar functions from left to right as they appear on the toolbar. Please note that to scroll down a page when reading a page in zoom mode you need to move the mouse up and down. The scroll wheel (if present) is inoperative. *Please note that the numbers have been added for explanation only and DO NOT appear in the actual flip book. This automatically turns the pages for you about every 5 seconds. Useful for a quick scan before reading. This sets out the whole book as pairs of pages for easy viewing of the entire book. You can click on any image and view the pages normally. This function offers a range of the most common social media sites which allow you to spread the word about the book and this website. Accessed from the Printer icon and allows you to print either the left or the right hand pages independently. To increase the size of the text there are zoom functions on the top tool bar indicated by the magnifying glass icon with the “+” in it. Once zoomed, simply move the mouse up or down to scroll – the mouse wheel (if you have one) will not work here. You can bookmark the page you are on with this function. Bookmarks will appear in the LHS of the page with the page number shown. To delete a bookmark, click on the star icon (bookmarks) again. You can toggle between normal view and full screen (which expands the size of the book) with the four arrows icon. You can look for key words or phrases with this function and access them directly from the search results.